About six years ago my wife Rachel and I decided to move from Washington state and open a four-station salon in a small town in central Oregon. She had been doing hair since 2004, mainly part time while raising our family, and eventually decided to go full time. Ultimately we went out on our own and started our own place, dubbing the business 9 Salon. Today, Rachel is busy working away behind the chair while I manage the business side, all while balancing my digital marketing career. When we first started our salon, there was just so much to take into consideration. What location was best, how many stations we could manage, what décor we liked, how to choose a salon name, etc. We were sure that we needed salon software to help with scheduling and general management, so we made that a priority starting day one. I didn't know 100 percent what we needed with software but I did know that we would require some of the basics: easy point of sale (POS), online booking, inventory management, and the ability to run daily, weekly and monthly reports. As we were looking into what was available, we soon realized that most salon software was designed for PCs. There just was not much available for Mac users like us. That’s when we decided to go with Rosy Salon Software, a cloud-based system, which would work regardless of what type of computer we were using. Also, it would allow real-time online booking, which was a major must-have feature for us. The beauty with online client scheduling is that it’s completely automated and pretty much takes care of itself. Clients can go online as their schedule permits and book an appointment and we get bookings without ever having to even talk to them. Today, about a third of our clientele books online with us, as it’s a great convenience for them, but it’s also a huge timesaver for me. I am the main receptionist, so I’m the one answering the phones. In addition, about 30-40 new clients register per week through our online scheduling, which is due in large part to how well we have positioned our search engine optimization (SEO) for our online presence. For a salon of any size, these numbers are impressive, but for a small, four-station salon, those results really are quite phenomenal. The other benefit with going with web-based software, is the ability to work remotely. In fact, I am rarely even in the salon, as I can run the business from pretty much anywhere. I go in maybe once a week, pick up the mail, take care of it a few small details, but that's about it. If I'm not in the salon and somebody calls, it’s usually for an appointment, which I simply go online to book for them. Otherwise, if they are asking to talk with a particular stylist, I can look at the schedule to see if they are with a client or not. Our hair stylists also have their own login and can check their schedules remotely as needed. They even get update texts if there are any urgent changes. For example, if a new or existing client schedules online in the evening for a nine o'clock appointment the next morning, the system sends a text to the stylist to let them know to come in earlier for the appointment. It’s been a great feature that just works seamlessly behind the scenes. Another feature that I love about our software is the automated email system. With my background in digital marketing, I am big on client communication and engagement. I use the system to create a series of automated emails, starting with a Thank You for new clients. I used to send these emails out one by one each night after we had new clients. We're a smaller salon so there were only a handful to send each day but it's still nice to save that time and spend it with my family instead. I look for ways to automate any time I can. It is great to know that some of our marketing practices are being taken care of for us as an automated system through the software. While running the salon, I juggle a lot of things and one of the tasks is making confirmation calls each day. Unfortunately, on busy days they can become a low priority. We’ve always had an automated email confirmation system in place but our software recently added text confirmations. With this added feature we saw an immediate increase in confirmations, in fact between email and text confirmations, about 85-90 percent of our bookings confirm without me having to make a confirmation call. We have it set up where an email confirmation goes out two days in advance and, if they don't respond, a text confirmation goes out the next day. There's also a reminder two hours before their appointment the day of. I am finding that a much higher percentage of people respond to text messages than they do emails. With everyone having a smart phone in hand, the text messages are right in front of them and are more noticeable. When they come through, they are just more likely to confirm their appointment. And more confirmed appointments mean substantially fewer no-shows! What I love about our software, is that it helps manage our salon in so very many respects. It works in ways that automate many processes to serve our clients better and streamlines others to save us time. 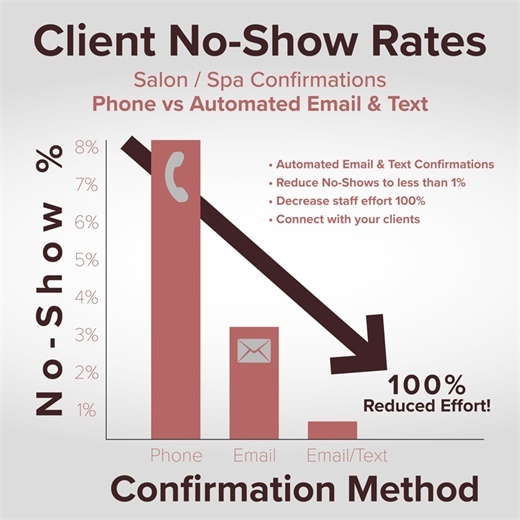 Without features like online scheduling, text confirmations, email marketing, and being able to work remotely, our salon would not be as efficient, let alone successful. The most important thing is the time we save, which now can be spent with family… the reason we work so hard to begin with! Dustin NcCorchuk is a salon owner and salon marketing strategist who helps other salon professionals grow their clientele through dominating Google search.